All students are expected to seek, and the university is expected to provide, appropriate advising resources. These resources may include (but are not limited to) general university advisors, specific faculty advisors, special program advisors, career development counselors, advising seminars, advising workshops, and advising publications. General advising is available at the Academic Advising Center located in Hertz Hall, room 107. Faculty advisors are responsible for providing general education, as well as major program advising. Students are also encouraged to seek advice from various faculty concerning specific areas of interest or from faculty who serve as general advisors. Continuing freshmen are required to meet with their general academic advisor located in Hertz Hall or departmental advisor during Advising Week, which takes place the week prior to registration. During this meeting the student and advisor will discuss the appropriateness of the student’s schedule in obtaining their career and academic goals. Students are required to meet with their advisor the quarters after they have obtained their 75th and 115th credits. During this meeting the student and advisor will discuss the students’ academic plan for either being admitted into the major or for completing the major and university requirements needed to graduate. It is strongly suggested that all other continuing students also meet with their advisors during Advising Week. If a student does not enroll for two or more consecutive quarters at Central (excluding summer), he or she will be required to reactivate his or her major status. Unless a student applies for an official leave of absence from the school. Reactivation must be done with the concurrence of the department and in accordance with department and the OEC requirements current at the time of readmission. A leave of absence should be requested, if a student is going to opt-out for a quarter (excluding summer) at Central. Leave of absence forms are due by the end of the quarter prior to the quarter they are requesting their leave. This will allow the student to be eligible for registration, maintain status in their major, and the student will not have to re-apply for admissions. Currently enrolled students may register for courses by using Safari, the web registration system. Registration for new and readmitted students will take place during new student orientation. Registration, in-person, by telephone, or web, obligates students for payment of all tuition and fees. If tuition is not paid by the due date, students will be liable for a late fee and for any other reasonable collection costs and charges. Consult the annual registration handbook that is available at Registrar Services or the university center administration office to determine exact dates for early registration, open enrollment, tuition deadlines, and the change-of-schedule period. 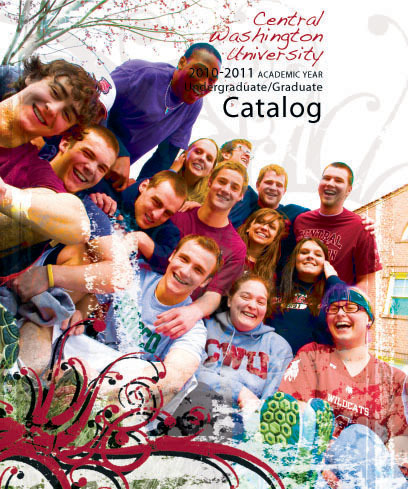 The registration handbook is also available on the web at www.cwu.edu/~regi. CWU operates on a quarter system and gives quarter credit. Other colleges operate on a semester basis (i.e., divide the academic year into two parts, exclusive of summer) and give semester credits. Quarter credits multiplied by two-thirds equal semester credits. Semester credits multiplied by one-and-one-half equal quarter credits.The rule for determining academic credit is: one credit represents a total time commitment of three hours each week of the quarter. A regular load of 15 credits requires 45 hours of work per week. The total time includes class time, studying, conferring with the instructor, writing, performing laboratory work, exercising, or performing any other activity required of students. A minimum of 180 credits is required for a degree. CWU operates on a quarter system and gives quarter credit. Other colleges operate on a semester basis (i.e., divide the academic year into two parts, exclusive of summer) and give semester credits. In order to calculate credit multiply the quarterly credits by two-thirds to equal semester credits,or multiply semester credits by one-and-one-half to equal quarter credits. OEC current at the time he or she is accepted by the department into the major or minor program. Students being called to active duty will be placed on a leave of absence until their return, at which time they will be reactivated, so they will not need to re-apply to the university. Students should contact Registrar Services when they are ready to return to Central to ensure a smooth transition. For undergraduate students, the “IP” grade is used when the student was not able to be evaluated by the end of the term, usually because instruction is not yet completed. “IP” is used for special circumstances within programs such as flight technology, international studies, and cooperative education. Dividing 42.4 by 17 gives a grade point average of 2.49. In computing cumulative grade point averages, only work attempted at Central will be included in the computation, with the following exception: cumulative grade point average for students in the Teacher Preparation Program will include all coursework from all colleges attended. Within the major, minor, and professional education option, grades earned in all allowed courses are used. Credits earned at other institutions are accepted in meeting degree requirements according to the limits described under bachelor’s degree requirements. Undergraduates who achieve a grade point average of 3.5 or higher will be named to the honor roll. To be eligible, a student must complete a minimum of 12 graded credits in the quarter earned. Central will provide honor roll recipient names to student’s hometown based on the student’s permanent address listed on Safari at the end of the quarter. If a student has placed a directory restriction on their record through Safari, the hometown newspaper will not be notified of his/her honor roll status. Post-baccalaureate and master students are not eligible for the honor roll. The honor roll status is listed on your unofficial transcript and is posted two to three weeks after grades on the web located at www.cwu.edu/honor-roll. Students who believe they have been improperly graded should first attempt to resolve the matter with the instructor. If resolution is not achieved, the student may appeal the grievance to the department chair. Failing resolution at that level, the grievance may be submitted to the college dean. Finally, if the grievance is not resolved at the dean level, the student may petition for a hearing with the board of academic appeals. For details, contact the Office of Student Affairs in Bouillon Hall, room 204 or by calling 509-963-1515. Academic standards are established by the faculty. The associate vice president for student affairs has responsibility for implementing these standards. A student’s academic standing appears on the quarterly grade report or unofficial transcript located on Safari. Questions about academic standing should be directed to the Office of Student Affairs (Bouillon Hall, room 204). The student may be denied enrollment for one year, following which a written petition for readmission must be presented to the associate vice president for student affairs; however, readmission is not guaranteed. A letter will be sent to the student informing him or her of the associate vice president’s decision. If academic forgiveness is granted, the previous credits and grades at CWU will remain on the student’s transcript but will not be used in the calculation of the cumulative GPA, and the student will be in good standing. Only the grades earned since returning to CWU will be used in computing the CWU cumulative GPA. Instructors may require regular class attendance. The first day of the quarter is the first day of instruction listed in the university calendar. An instructor may drop a student from the class by notifying the registrar if the student has failed to attend the class by the end of the third day of the quarter or the first class meeting if the class does not meet during the first three days of the quarter. Students enrolled in web courses should make a post on blackboard within the first three days of classes to endure they are not dropped for non-attendance. Students are responsible for checking their schedules by the fifth day of class to ensure their class schedule is correct. Students may petition the appropriate department chair if they wish to substitute courses within degree requirements. The course used for substitution must be similar in content to the required course. The substituted course(s) credits may not reduce the total required credits. Permit to Substitute form can be obtained from the Office of the Registrar. The student should be aware that procedures have been established to hear complaints regarding academic matters. The board of academic appeals exists to guarantee due process for academic grievances involving students, faculty, staff, and administrators. The academic appeals policy is established by the faculty senate and is administered by the associate vice president for student affairs. Students are required to participate in assessment activities at several points during their academic careers. They will be assessed for placement into English 101, Math 101, and above upon entering CWU as freshmen. Students with deficiencies in English usage/reading or computation must correct them prior to enrolling in ENG 101 or MATH 101 and above, respectively. Students will be tested for proficiency in English usage, reading, and computation after the student has completed 90 credits but prior to accumulating 110 credits. Departments may establish their own requirements as long as they meet or exceed university standards. Departments may also require students with deficiencies to correct them before being accepted into their major.